Tennessee Crab Orchard Walkway and Patio Stone brings almost woodgrain quality colors and patterns to this Landscape Stone. Tennessee Crab Orchard Walkway and Patio Stone also works well for pool decks, porch decks and fireplace and spa areas. The base color is a light cream to ivory or light brown. The grain colors and color accents lean towards brown or red but can vary widely. This is a lively colorful landscape stone and grabs the attention of those close by - it's the wood grain like patterns that fascinate people. Tennessee Crab Orchard Walkway and Patio Stone matches a range of other products we carry in the Tennessee Crab Orchard Family Of Stone. Tennessee Crab Orchard, Full Range Color walkway and patio stone. Also called TCO. A uniquely beautiful stone from Tennessee known for it's intense graining and unique combination of colors. The base color is white to tan, even pink at times, on top of that is intense graining patterns typically in shades of brown, rust, salmon and even black. Pieces are cut to exact dimensions so coverage is dependent on how much you buy. A typical pallet of 1.5" TCO will cover an average of 180 square feet. Tennessee Crab Orchard Walkway and Patio Stone is a unique walkway and patio stone that has grain so intense that it rivals the finest wood grains. Quarried in a section of Tennessee the stone is uniquely colorful with a base color of white to tan and then intense and colorful grains mixed in. This is easy stone to work with. and comes in precisely cut squares and rectangles for easy installation. Tennessee Crab Orchard Walkway and Patio Stone brings the unique beauty of wood grain finished to the stone world. There are 2 basic Tennessee Crab Orchard colors - Full Range and Gray. Full Range is much more colorful than Gray - which is shades of charcoal. 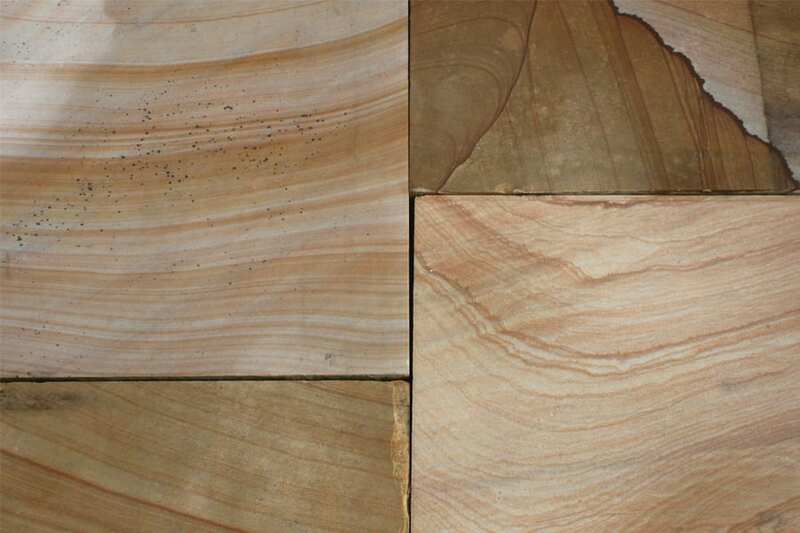 Full range includes a base color of White, Tan or even Rose and grain colors of Brown, Rust, Black and Salmon. Gray is shades of charcoal with far less visible grain.